Here’s the fort. It’s small but surrounded by barren rock which would provide the Turks with no shelter and make it very difficult for the besiegers to undermine the walls. It was a chastened army command that met at Mustapha’s tent on June 17 to reanalyze the intractable problem of Saint Elmo. Turgut again pointed out the Ottoman blind spot in the whole operation: their failure to close the supply route across the harbor to Birgu had allowed the fort to be continuously resupplied. The Turks started a new trench down the shoreline to the point below the fort where boats from Birgu were accustomed to land. And they strengthened the battery pummeling the cavalier. With this initiative, it became apparent that the end must be near. When the grand master heard of this work, he is said to have given thanks to God that the Turks had been so slow to cut the fort’s lifeline. Twelve knights volunteered to assist the fort, but La Valette refused. It was pointless to lose more men in a vain cause. He dispatched two boats with desperate letters to Don Garcia and the pope, begging for help. One was taken by the enemy, but to Mustapha’s fury, he could find no renegades in his army who could break the code. In Birgu and Senglea they pressed on with the fortifications. The next day brought a brief moment of cheer. Accounts of what happened differ. The Ottoman army command was in the trenches down by the water supervising a gun battery. Most likely, the cannon were firing too high and Turgut ordered the aim to be lowered. Because the cannon were still aiming too high, he instructed a further adjustment. The third shot was too low. It failed to clear the trench above and struck the wall; stone splinters were hurled across the gun platform. One caught Turgut beneath the ear. Another hit Soli Aga, the master general of the army, killing him outright. Turgut, protected by his turban, fell to the ground badly wounded. The old corsair lay there, unable to speak, his tongue hanging out of his mouth, blood spurting from his head. Mustapha, unperturbed by the devastation around him, had Turgut covered up and carried away secretly to his tent in an attempt to preserve morale, but word quickly got out. Renegades soon reached Birgu with news of the accident. Turgut lingered on, unconscious, neither dead nor alive. The Ottomans pressed forward. The following day the pummeling of one of the bastions was so intense that a breach had been opened sufficient to permit easy scaling of the walls; repairs were becoming almost impossible. The men could not sally out to gather earth without being shot dead; they filled the breaches as best they could with blankets and old sails, and crouched below the parapet. During the night a massive explosion rocked the whole harbor basin; a powder mill accidentally exploded on Birgu. The Turkish troops cried with joy. La Valette fired half a dozen cannon shots across the water to quell their enthusiasm, but the news for the defenders was unremittingly bad. On June 20, the new Ottoman gun platform guarding the harbor was finished; it was no longer possible to get boats across from Birgu even at night. A last boat had made the journey on the night of June 19; it was quickly spotted. One man was decapitated by a cannonball on the way over; another was killed by arquebus fire on return. Miranda relayed a last message to the effect that it was cruelty to send more men to die. Henceforth only Maltese swimmers, slipping silently into the night sea, could make the crossing. La Valette reluctantly agreed that nothing more could be done. June 21 was the feast of Corpus Christi, a signal day in the Christian calendar. “We, for our part, did not fail to honour this great and noble day as best and devoutly as we could,” Balbi recorded in his diary of the observances on Birgu. There was a procession, in which the grand master participated, though the route had to be carefully chosen to avoid enemy fire across the harbor. 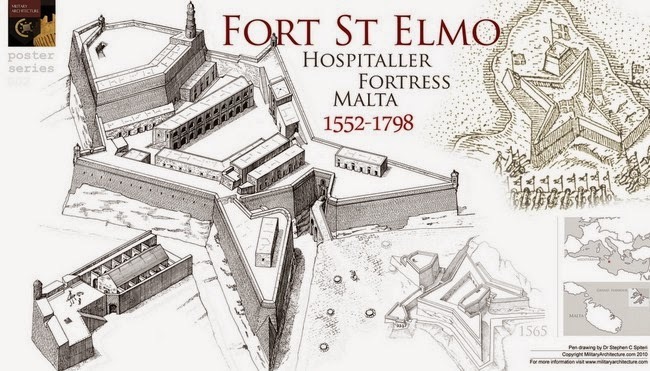 The garrison of Saint Elmo was at its last gasp. Now a dozen of the best Ottoman snipers had established positions high up in the side of the cavalier from which they could probe the heart of the fort. Even the parade ground could be hit. Yet the defenders kept trying to set fire to the brushwood filling up the ditch; one man, the Italian Pedro de Forli, lowered himself over the wall on a rope with a flamethrower strapped to his back to attempt to destroy the threatening bridge. He failed—the bridge was too well covered with earth; it is not known if he made it back alive. And the bombardment went on. All night Ottoman guns pummeled the shattered walls; regular false alarms kept the weary men blinking out into the darkness. Now they could go only on all fours beneath the parapet; it was impossible to leave their posts. The priests crawled up to them with the sacraments. At dawn on June 22, Mustapha resolved to finish the job off with another general assault. He ensured that Saint Elmo was completely surrounded; Piyale brought up his galleys and bombarded the stricken fort from the sea. Small boats crammed with arquebusiers guarded the crossing from Birgu. Again the janissaries surged over the bridge; the complete circumference of the fort was throttled by thousands of men raising ladders against the wall. It was hand-to-hand fighting on the parapets with the Muslims trying to plant their banners, the Christians hurling rocks and pots of fire onto their unprotected heads. The defenders were now being shot in the back by snipers lodged on the cavalier, who picked off the knights in their ostentatious armor. Montserrat, the fort commander, was beheaded by a cannonball. According to Giacomo Bosio, “the sun was like a living fire.” The Christians roasted in their helmets and plate armor but fought on hour after hour. From Birgu, the knights watched in terror and confusion. They heard the cries, the thump of the guns, saw the doomed fort “covered in flames and fire.” And then after six hours of confused tumult, the sound of voices could be heard drifting across the water, shouting in Italian and Spanish: “Victory! Victory!” The attack faltered; the Ottomans drew back. Somehow Saint Elmo had held out. Under the afternoon sun, the survivors crawled across the ruined fort. Many of the commanders were now dead; others—Eguerras, Miranda, Mas—were too wounded to stand. Bodies sprawled across the parapet and lay dead in the parade ground where they fell. It was no longer possible to bury or even move the corpses. The walls had been breached in many places; there were no materials to make repairs. In the atomizing summer heat, the smell of stone dust and gunpowder, the buzz of flies, the stench of the dead. It was the twenty-sixth day of the siege. Those who could still stand gathered in the small church. Here, in the words of the chroniclers, “everyone resolved with one accord to finish life and the human pilgrimage.” They decided to make a final appeal for help. A swimmer slipped into the sea and a last boat also put out. It was attacked by twelve Turkish barges but somehow made it across. Both boat and swimmer delivered the same message: they were at their last gasp. There were very few men left alive and most of these were wounded; they had no more incendiaries and little powder. They had no hope of relief. La Valette listened to these words with a stony face. He had willed these men to resist to the very last, and that moment had now come. “God knows what the grand master felt,” Balbi wrote in his diary. He refused all requests to send more volunteers; it was simply a waste of precious resources, but relented to the extent of permitting a small flotilla of boats to attempt to run the blockade with supplies. Five captains, including Romegas, put to sea in the dark. The attempt was futile; they were spattered with fire from the shoreline and then ran into eighty of Piyale’s galleys lurking off the point. When the defenders saw this attempt had failed, they “made themselves ready to die in the service of Jesus Christ.” They were unable to leave their posts, so “like men to whom the next day was to be their last on earth, confessed to each other and implored Our Lord to have mercy on their souls.” In anticipation of acts of desecration, the priests buried the Christian utensils under the floor of the chapel; the tapestries, pictures, and wooden furniture they took outside and burned. The Ottoman guns kept hammering the fort. All night La Valette watched from his window; he could see the fort vividly illuminated by flashes of gunfire. Saturday, June 23, Balbi wrote in his diary: “At sunrise…being the eve of the feast of Saint John Baptist, the name-saint and protector of this Order, the Turks began their last assault.” Piyale’s ships closed on the stricken fortress, with their bow guns forward, and started to bombard. The army massed at the walls. Inside there were only seventy or a hundred men left alive. All were exhausted; many were wounded. They searched the corpses of their fallen comrades for the last few grains of gunpowder to prime their arquebuses. Miranda and Eguerras, unable to stand, were placed in chairs with their swords in their hands. For four hours the men held the line. Two hours before midday, there was a visible pause in the assault. When the janissaries and sipahis lined up to attack again, there was no answering fire. The gunpowder was all gone. Six hundred men lay dead in the square and at the walls. The surviving defenders grasped swords and pikes and stood their ground but the arquebusiers no longer hid. Sensing that resistance was at an end, hundreds of men poured over the bridge and climbed the parapets unopposed, slaughtering all they met. Others disembarked from the boats. In the parade square the fort lived its last ghastly moments. Under the watchful eye of Mustapha, men were being lined up against the wall for target practice and shot full of arrows; the wounded who made it to the church were killed inside; the knights were the targets of particular hatred. They were hung upside down from iron rings in the arched colonnades and had their heads split, their chests ripped open, and their hearts torn out. A frenzy of bloodshed and madness came upon the janissaries whose pride had been so badly dented. A few of the surviving professional Spanish and Italian troops fell on their knees and cried out that they were not knights and begged “by your god” to be saved. It made no difference. One unfortunate, seeing the slaughter, ran to hide in a chest. Two renegades found the weighty item and were carrying it away in the hope of profitable loot when they were stopped by Mustapha, who demanded the chest be opened in front of him. The dumbfounded man inside was hauled away and killed. No one was to survive. Now that the last obstacle had been dismantled, the whole of Piyale’s fleet, with banners flying and guns booming, entered the harbor of Marsamxett. Lying safely at anchor, they could look up at the Ottoman banners fluttering from the castle walls. Mustapha had thought to kill every living thing in Saint Elmo, but he failed. Some men, fleeing from the fort down toward the sea, were not taken by the vengeful Ottoman army but surrendered to Turgut’s corsairs and were spirited away as ransomable booty. Some of these, including Francesco Lanfreducci, would reappear, as if from the dead, years later. And four or five Maltese, unencumbered by armor, slipped out of the gates down to the water facing Birgu and hid in some caves on the shore. After dark, these men slid into the night sea and swam silently across to Birgu to deliver a firsthand account of everything they had seen.